If some time has passed since your last dental visit, your teeth and gums are not the only things at risk. When you visit the dentist’s office for your routine checkup, the dentist will perform examinations for oral cancer and other abnormalities. 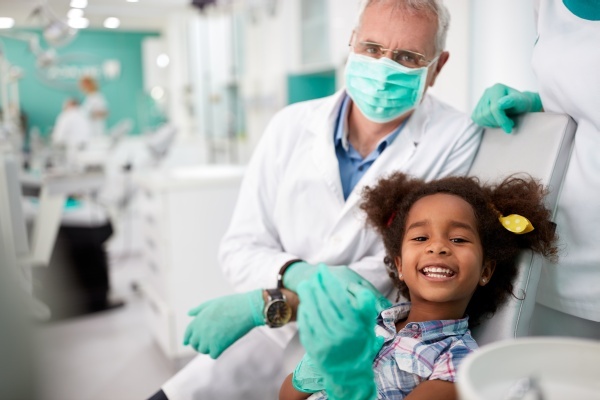 A typical dental visit is divided into two parts: Checkup and cleaning. During the checkup, the dentist will look for cavities through physical examination or by taking X-rays. Any plaque will be cleaned before it hardens into tartar and causes a series of oral diseases. Using a small tool, the dentist will gauge the depth of the gap between your teeth and gum. The checkup will also involve careful examination of your throat, tongue, head, face and neck. This is to see if there is anything abnormal. Dentists may notice inflammation, redness or potential signs of cancer. The dentist or hygienist will also clean and floss your teeth. Brushing and flossing can remove plaque but not tartar. There are special tools in the dental office for removing tartar. This process is called scaling. After scaling, the dentist may polish your teeth with a gritty paste. This eliminates small stains and can whiten your smile. The American Dental Association recommends oral cancer for everyone, not just for smokers and people above the age of 55. Due to HPV, or human papillomavirus, the American Cancer Society has witnessed a surge in cases of oral and throat cancer in young people. During your dental appointment, the dentist will perform oral cancer screening before or after the usual checkup. For the oral cancer screening, the dentist will inquire about your family history to check if any form of cancer is present in the family. The dentist will also want to know if you have had difficulty with swallowing recently or if eating has been a nightmare for some time. During the screening session, the dentist will ask if you experience recurrent earaches or have painless, little lumps beside the neck. They may also ask if you find it hard to move your tongue or talk. When the question and answer session is complete, the dentist will proceed to check your mouth. This step includes checking the tongue for suspicious occurrences such as red or white patches. Aside from examining your mouth tissue for lumps and sores, the dentist will also check your head and neck. If the dentist finds anything suspicious, they will take a biopsy or skin sample and forward it to a pathological lab for more examinations. According to the American Cancer Society, close to 52,000 people were diagnosed with oral cancer in 2018. This number can reduce if people learn excellent oral hygiene habits and receive the HPV vaccine. Lifestyle choices such as alcohol and tobacco use can affect your chances of developing oral cancer. See your dentist at least twice a year to not only keep your teeth healthy but to catch early signs of oral cancer as well. « What Is Dental Implantology?